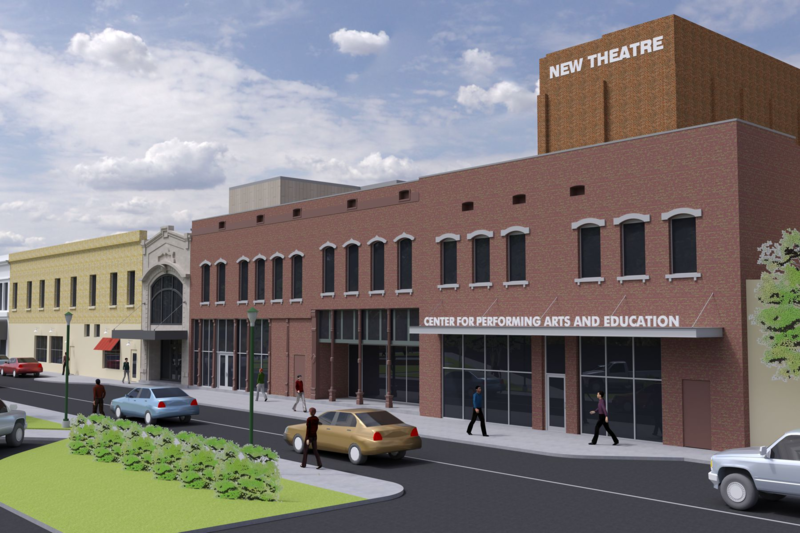 March 26, 2019, Fort Smith – At a press event yesterday, 64.6 Downtown announced the renovation of the historic Sparks New Theatre into a Modern Performance Theater with attached Performing Arts and Education Campus. Located at 9 North 10th Street in downtown Fort Smith, the historic New Theatre once served as the center of entertainment for the community. The transformation of this vacant building provides a regional hub for performance arts ushering theatre, music and dance into a cultural revival the community has been experiencing over the last few years. 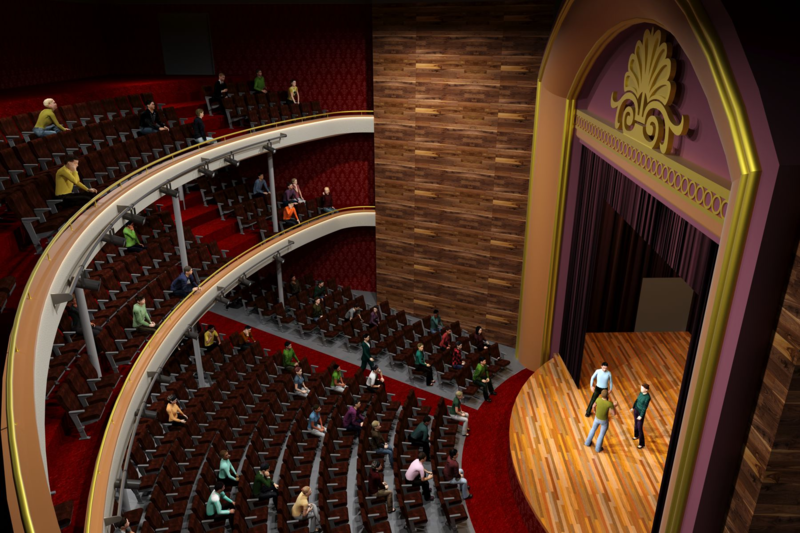 The campus plans call for a renovated theatre seating 600+, a 2-story gallery entry for gathering before and after performances and state of the art lighting, sound and projection equipment. The adjacent buildings, as well as the former Landmark Sign buildings will provide office, meeting and rehearsal spaces, dressing rooms, laundry facilities, set construction and storage spaces, and Green Rooms for visiting artists. The arts and education center will have direct access to the back of the main stage of the theater. Once complete, the campus will be approximately 26,000 sq. ft. Finally, the size of the theatre fills a definitive gap in local venue space. This modern performance theatre with attached arts education center enables over 20 identified performing arts troupes to have a place to call their home. The inclusion of a scholarship program into the budget of the Arts Education Center, will help to ensure that this facility and its programming are accessible across all socioeconomic classes. Phase one demolition began in January 2019. Next steps include continued demolition of interior spaces, removing and replacing the alley exterior fire escapes, and some remediation of materials in the old Landmark Sign building. New construction is anticipated to begin in October of 2019. We are looking forward to a gala opening weekend in January of 2021. The activation of the New Theatre aligns with the Propelling Downtown Forward master plan in transforming places and corridors for reinvestment. The New Theatre maximizes the infill development in the urban core. Its proximity to Cisterna Park, in combination with the walkable commerce, furthers catalytic opportunities. This important downtown project will now become a reality thanks to the very generous financial support of the Windgate Charitable Foundation, the Griffin Family Charitable Trust, Dwight Curry, the Board of the Young Actors Guild and other local citizens. George Taylor Sparks, a well-traveled banker, was inspired by the New Amsterdam Theater on a trip to New York in 1903. Upon return to Fort Smith, he made it his mission to create a theater in downtown which could accommodate the space and technological needs of a New York production. Although he never lived to see it completed, the work he began was finished in 1911. The theatre boasted a large stage with a 70-foot fly space. Over 1,000 lights could be controlled from a single backstage panel. The wooden stage was built box-style, placed over the dressing rooms. The resulting low head-room was offset by generous amenities, including lavatories, running water, and dressing tables. A large open proscenium allowed famous lines from the likes of Shirley Temple and Will Rogers to float easily into the 1,200-capacity audience. In the late 1930s, the New Theater went on to become a Malco operated movie theater before falling into disrepair in the 1980’s. It was placed on the National Register of Historic Places in 1999. 64.6 Downtown is a nonprofit founded in 2015 by Fort Smith entrepreneur Steve Clark with the purpose of creating vibrant spaces in downtown Fort Smith to further economic development. It’s responsible for Garrison Commons, downtown’s only pocket park, the award winning short documentary I AM WE, Gateway Park at the intersection of Rogers and Garrison Avenues, the award winning downtown master plan Propelling Downtown Forward, and the award winning The Unexpected, bringing urban and contemporary art to Arkansas. For more information visit www.646downtown.com or email claire@646downtown.com.